Flight Simulator X is the culmination of nearly 25 years of the landmark Flight Simulator franchise and the most significant addition to date. The 10th addition to the highly successful Flight Simulator franchise, this newest addition will immerse players in a beautifully rich and realistic world, offering a completely new and innovative gaming experience with dozens of new aircraft to choose from, including the AirCreation 582SL Ultralight and Maule M7-260C Orion with wheels and skis. Gamers of all ages, types and skill levels will experience firsthand what it is like to be an aviator traveling the globe either alone or online with others. Flight Simulator X offers players a rich and innovative gaming experience with new technological advancements, incredible graphics and added realism, including weather, time of day and seasons. Pilots can watch moving cars and detailed buildings in cities below, traffic on highways, indigenous houses, farmland and livestock, and wildlife in their natural habitats. With the addition of new mission-based gameplay, players will have a specific purpose as their world comes alive for the first time with automobile traffic, moving boats and ships, and animal life. With more than 50 new missions to choose from, aviators can build their skill levels and engage in even more stimulating gameplay than before. Players can choose to compete in the Red Bull air race or bring relief materiel to the Congo , keeping track of their progress on each mission. Flight Simulator X will provide pilots with the ability to fly the aircraft of their dreams, from the DeHavilland DHC-2 Beaver floatplane and Grumman G-21A Goose to the AirCreation 582SL Ultralight and Maule M7-260C Orion with wheels and skis. Players will be amazed at the details, such as shaded rivets, reflective paint, and glint from glass and chrome, as they view the world from 100 to 1 million feet. Through increased online gameplay capabilities, Flight Simulator X offers players a connected world where they can choose whom they want to be, from air-traffic controller to pilot or co-pilot, as they interact with other aviators from around the globe by chatting in real time via headset and keyboard. More than 24,000 airports feature artificial intelligence-controlled jetways, fuel trucks and moving baggage carts, allowing players to explore their hometown or venture to a favorite far-off city. Includes the new Garmin G1000 in three cockpits, additional aircraft in the fleet, Tower Control capability, and a SDK pack for development. With Flight Simulator X: Gold Edition - Take to the skies again as Microsoft Flight Simulator X Gold: puts pilots back in the cockpit for more than 80 missions set all over the world. Want more? Try the thrilling multiplayer mode where you can race your friends for victory and bragging rights. Microsoft Flight Simulator X Gold delivers that sense of immersive realism that only the award-winning Flight Simulator series brings to flight sim fans. And with advanced DX10 graphics, heading into the wild blue yonder has never looked so good. New Missions. 20 new missions, in Law Enforcement and Rescue, Astronautics, Racing, and Backcountry, will give pilots more chances to soar. Head to the Rockies to fight forest fires or fly relief supplies to the Congo. With the world beneath you, anywhere is possible. Dynamic Living World. Watch as the world under you comes to life, from the gates and fuel trucks at your local airport to the hustle and bustle of cities. Experience the challenges of landing at your local airport as day turns to night and as the seasons change. Multiplayer Racing. 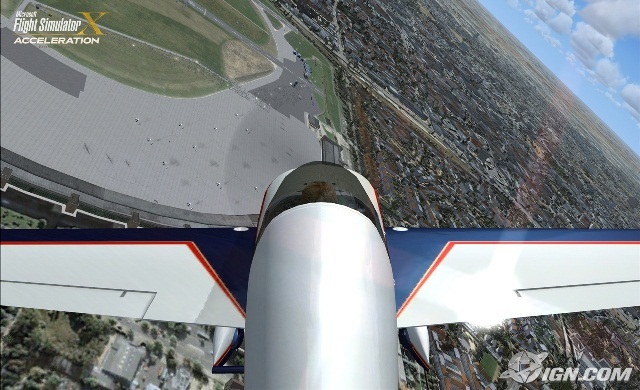 Race against friends online in challenges such as Red Bull Aerobatics, Sailplane, Cross Country, and Reno High Speed. All in One Package. For the first time, Microsoft Flight Simulator X Gold gives players the chance to purchase Microsoft Flight Simulator X and Microsoft Flight Simulator X: Acceleration together in one bundle. The Flight Simulator X Acceleration Expansion Pack delivers an all new thrilling multiplayer race mode, new action-packed missions, more new content, and newly enhanced DX10 graphics! Also included is an important service pack for FSX, improving overall FSX performance. Challenge friends in the new racing mode, or test your flight skills in the 20 new missions like being a NASA test pilot, performing search and rescue on an ocean liner, or navigating a whiteout blizzard in the backcountry. Also included are six new scenery maps including the famed Red Bull Air Race courses, and three new planes such as the F/A-18A Hornet.